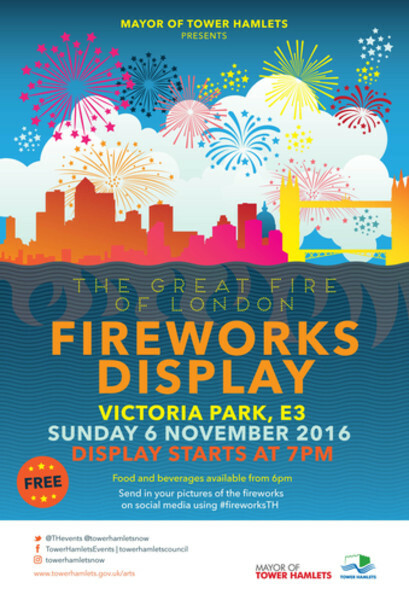 350 years after the ‘Great Fire of London’, you can enjoy a spectacular display as the skies above Victoria Park are ablaze with light and colour in celebration of Fireworks Night. creating a fire drawing to illustrate this incendiary tale against the blank canvas of the night sky. The display will start at 7pm but food and beverages will be available to purchase from 6pm. Please allow plenty of time to get from park entrances to the viewing area. Please refer to the below map which indicates which gates will be open during the event. For transport info please call Transport for London on 020 7222 1234 or go to www.tfl.gov.uk. No parking at this site. 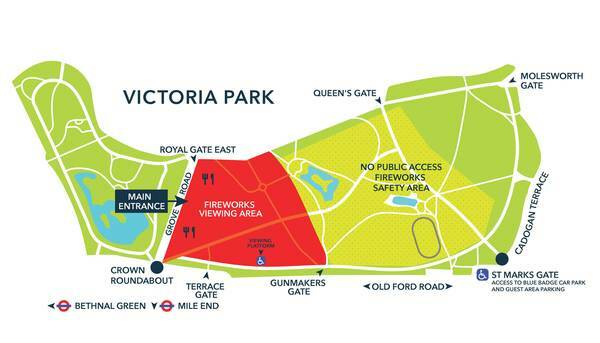 Please note that personal fireworks and glass bottles will not be allowed into the park.